Like most species of plants, The Datura spp. are not exempt from their fare share harmful relationships. Specifically, certain fungi, protists (interestingly, all of the protists listed below were previously classified as fungi), and insects are many times to blame for harm to the plant. The table below depicts several of these relationships. 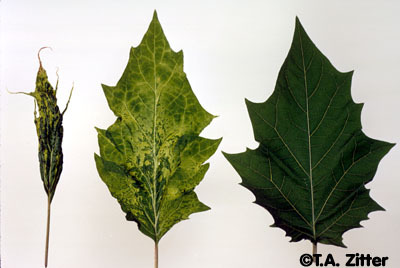 Although it may appear that with the use of fungicides and insecticides Datura stramonium may be protected, the reality is that the mentioned pest and diseases above are incredibly resilient and can/do appear whenever the plant is vulnerable. For these reasons, as stated in the habitat page, Daturas thrive in warm and sunny places were the soil tends to stay dry and aerated. This specified environment does not typically harbor as many of the organisms above. Also, Datura stramonium is not the only plant to suffer from these pests, orchids, along with many other plants are frequent hosts to the organisms above. While jimson weed's odor and taste usually deter animals from consuming it, on occasion it is known to happen. More commonly however Datura stramonium is accidentally harvested and mixed in to livestock feed. At this point animals mistakenly consume the plant, rather than eating it solely to subside their hunger. The result can be jimson weed poisoning and the effect in animals are comparable to those listed for humans below. A possibly surprising fact is that jimson weed is more commonly ingested by humans than animals. Although the medicinal and hallucinogenic properties are discussed on the facts page, the following shows the possible effects of jimson weed poisoning. These effects as stated before also apply to live stock/other farm animals that consume comparable amounts of the plant to their mass. ...Or return to the home page for a fresh start.